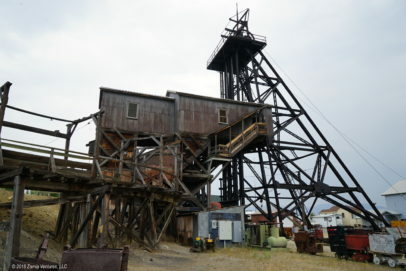 Butte is a mining town. The city developed entirely because of the industry, and even today the skyline is dominated by mine headframes everywhere. 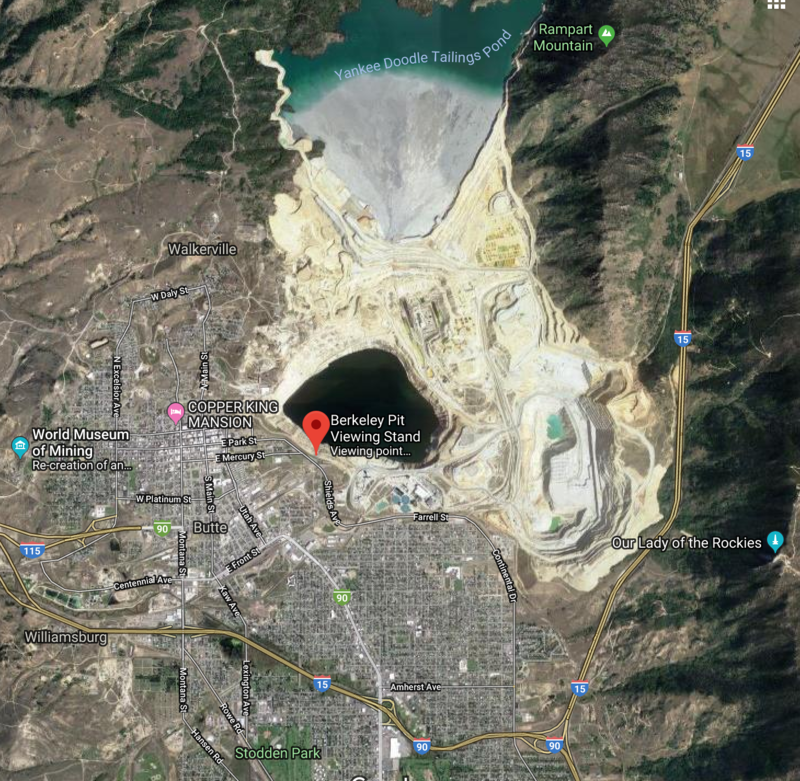 A cursory glance at the Google satellite view of the city will show a town that appears dangerously close to being consumed by the mines to its northeast side. Butte’s mining wealth results from rich deposits of valuable minerals underneath the city, mostly copper, zinc, manganese, molybdenum, and lead, but also some silver and gold. A few fun Butte facts provide some perspective on its significance as an economic engine. In 1915, when the world was becoming electrified, one-third of the world’s copper was produced from Butte mines. 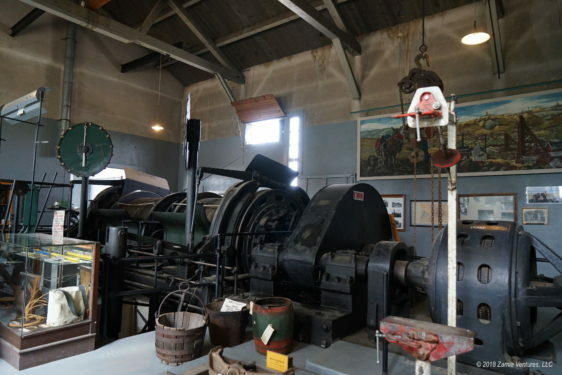 Butte had a power grid in place to serve its mines and the town before New York City did. In the early 20th century, Butte was the largest city between Chicago and San Francisco. 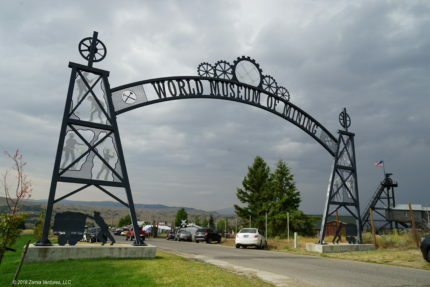 One of the most successful Butte mine operators, Copper King William Clark, was worth over $300 million at his death in 1925, equivalent to $4 billion in current dollars, making him far richer than his more famous contemporary J.P. Morgan. All this is a pretty remarkable contrast to the current situation: today Butte is only the 5th-largest city in a sparsely populated state with fewer than 1 million total residents. 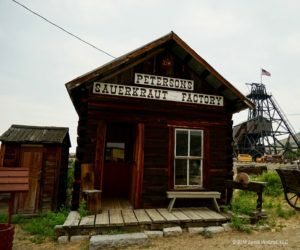 During our brief time in Butte we made sure to learn more about mining by visiting the extensive World Museum of Mining at the now-abandoned Orphan Girl Mine. The mining museum has a very extensive collection, but of course the centerpiece is a huge array of mining equipment and infrastructure. The primary physical challenges in mining are digging and lifting heavy rock out of the earth. Dynamite was the main tool for boring tunnels into the hard granite. 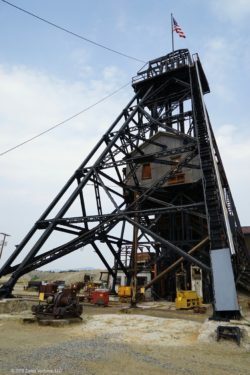 Miners have used a variety of devices to leverage human energy in this project, including machines powered by animals, steam, and compressed air. 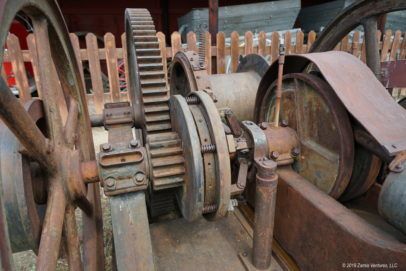 The mining museum displays a broad range of these devices, from simple hand-cranked winches resembling water wells that would be used by a one-man operation to the huge iron headframe of the Orphan Girl Mine, with a hoist capable of lifting cars filled with several tons of ore at once. There are literally a dozen different machines displayed that were used to create compressed air. It is an engineer’s paradise! All these items are displayed with helpful signage, so those of us with no mining knowledge at all were able to find out what the machines did and why the different versions were adopted (or quickly rejected and replaced). A good example of the thoroughness of the museum was an interesting display on the history of lighting devices used by miners. It included examples of everything from specialized candle holders and carbide lamps to early examples of battery-powered lights, along with a discussion of the pros and cons of each type of light. The amount of information provided by the museum was overwhelming at times. Let’s just say that we didn’t spend too long studying the extensive descriptions (with miniature models!) of different angles of timber interlock preferred by different mine operators in the area. One of the best aspects of the museum was that it was a very tactile experience. Visitors are able to see and touch all the main equipment of the Orphan Girl, including climbing up into headframe to see where ore was lifted out of the mine in small cars and then dumped down chutes into waiting railroad cars. We walked through the hoist room to see and touch the gigantic machine that worked 24/7 lifting the cars filled with tons of ore and with miners. So much equipment on display…. Most interesting was the opportunity to take a guided tour down into the Orphan Girl Mine. As usual, the tour guide makes or breaks the tour. Our guide was not only a 4th-generation Buttian whose grandfather and great-grandfather were miners, but in his day job he is a 7th grade social studies teacher who teaches Montana history, so he knew how to keep the crowd engaged! Inside the mine we looked down the main shaft, saw an example of how dynamite would be placed into drilled holes to extend the tunnel, and had the chance to touch various equipment like muckers. There were several interesting stories about the mules that were used to pull ore cars before the invention of electrical engines. 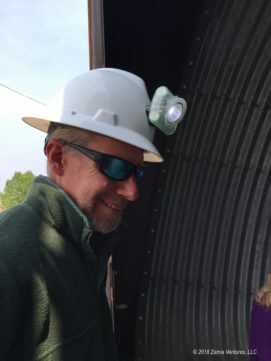 Best of all, I was really entertained by wearing a hard hat with a bright LED headlamp during the tour. Our guide in front of the cage. Not how I would want to get to work. The mining museum also features a collection of relocated / reconstructed historic buildings, assembled to recreate a 19th century mining town and given the Disney-esque name of “Hell Roarin’ Gulch.” Going in, I had pretty low expectations for this component of the museum. I was prepared to see something resembling the set of a cheesy western movie, with the obligatory smithy, stables, saloons, and brothel. 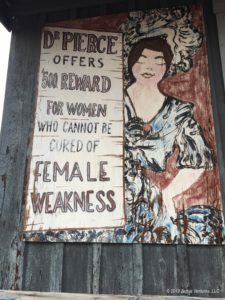 Instead, we spent several hours wandering through a surprisingly faithful reconstruction of a real mining town, in which every building was just packed to the gills with the tools, supplies, and inventory that would have been seen in that particular type of establishment, along with lots of interpretive signage. Many of the items had been donated by local residents and had real connections to Butte’s past. There was so much to see that there was literally something for everyone with even the slightest interest in history. Medical offices. I find medical history gruesome yet fascinating. So I was delighted to see fully outfitted dentist and doctor offices, complete with interesting equipment like a 19th century reclining dentist’s chair with rope pulls for changing the position. It was fun to read the ingredients and supposed benefits of the patent medicines in the drug store. The tools used by Butte’s first undertaker were another highlight. Union Hall. The history of mining is deeply intertwined with the history of organized labor, and the displays in the union hall included a detailed timeline of labor activity in Butte. The mineworkers union achieved many significant improvements in worker safety and welfare over the years, and to my surprise I also learned that Butte was considered a hotbed of communism in the early 20th century. Assayer’s Shop. In a mining town, an assayer who would analyze ores to determine their chemical content was a key figure for determining the value of discoveries. The primitive chemistry equipment was interesting, but the equipment on display in the assayer’s shop was made even more compelling because it had been owned by a woman who graduated from the Montana School of Mines here in Butte around 1900 and had a successful career as a pioneering woman scientist in Butte in the early part of the 20th century. Surveyors. As has been documented here on the blog extensively, I just love historical survey equipment. It was definitely a critical job in early Butte, where a parcel of land might include millions of dollars worth of mineral rights. Chinese Laundry and Herbal Shop. The displays in this shop alone could have kept us engaged for hours. They included information about Chinese immigration to the west, discriminatory laws, and the moves made by the Chinese business community to fight back. The apothecary was fully stocked with different plant and animal parts, with explanations of their medicinal uses. The shop even displayed translations of letters from home received by Chinese residents of early 20th century Butte, describing the experiences of family members during the Chinese revolution of 1912. Sauerkraut Factory. If you’re producing 300 barrels of sauerkraut per year, with each barrel weighing 400+ pounds, you need some mechanical assistance from cleverly designed cabbage choppers. And if this is your business, you will be nicknamed the Sauerkraut King of Anaconda. This is the story of Hans Peterson, and I really enjoyed seeing the original mechanized chopping devices that made this possible, along with photos of the family surrounded by giant piles of the cabbage that they grew for the enterprise. Church. The town even includes a relocated log parish church, which was originally consecrated as the twelfth Catholic church in the greater Butte area. Not coincidentally, Butte has one of the highest per capita Irish-American populations in the US. Whether it be fashion history, political history, science history, etc., there were just so many things to intrigue a history buff in the village area. Admittedly, there were a few areas that seemed to be showcases for “things someone found in the attic and couldn’t figure out how to discard.” There were apparently quite a few fraternal societies in the 19th century, with elaborate secret handshakes and even more elaborate ceremonial garb. I had never heard of the Knights of Pythias before, but they must have really loved velvet robes. 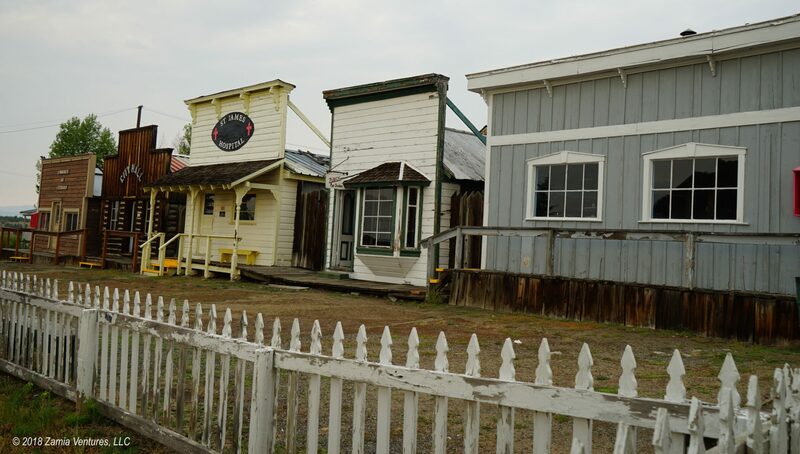 Our biggest complaint about the mining town was that all the buildings were closed, and visitors can only see the artifacts and displays by peering through the windows of the buildings. Given the incredibly large number of artifacts, and their small size, I can understand why the museum doesn’t allow people to wander through and pick them up. But a few of the buildings had glass vestibules that offered better viewing of the interiors, and it would have been nice if all the buildings had this feature. Even so, we were obviously captivated by the enormous breadth of artifacts and information displayed here. In the interest of full disclosure, I have to point out that not all aspects of the mining museum were equally interesting. The entrance building features a large collection of minerals from all over the world, of which I was mostly only interested in the cabinet featuring the ores found in the Butte mines. Even less appealing was the strange collection of miniature dollhouses, antique dolls, and collectible action figures. I find old dolls to be incredibly creepy to begin with, and placing them in a cabinet with a bunch of Star Trek figurines takes the weirdness to a whole new level. 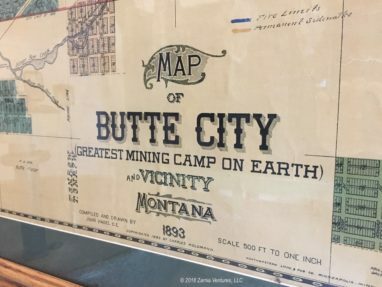 No discussion of Butte’s mining history would be complete without a mention of the Berkeley Pit, pictured on the map at the top. Subsurface mining ended in Butte, mostly because of costs, in 1950s. The Anaconda Copper Mine Company continued mining in the area, but switched to open pit mining. The Berkeley Pit grew large enough to actually swallow several neighborhoods before mining ceased in 1983. At that time, the water pumps that were keeping groundwater out of the Berkeley Pit were turned off, and the water level began its inexorable rise. The groundwater was not polluted, but when it came in contact with the sulfide-rich rocks of the pit the result was highly acidic water that leaches heavy metals from the rock. The water is so toxic that migrating birds unfortunate enough to land on the lake mostly end up dead. Today the pit is one of the largest Superfund sites in the U.S. A new water treatment plant is coming online shortly that will clean the water enough to release it into the Silver Bow Creek without destroying the whole watershed. The treatment plant will be able to prevent the water level from rising further, but it will never completely drain the Berkeley Pit. This environmental catastrophe is here to stay! I refused on principle to pay a $2 charge to ascend the viewing platform and see this monstrosity. 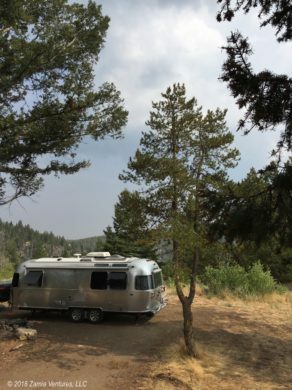 During our stay in Butte we elected to take advantage of free dispersed camping in the Beaverhead Deerlodge National Forest. 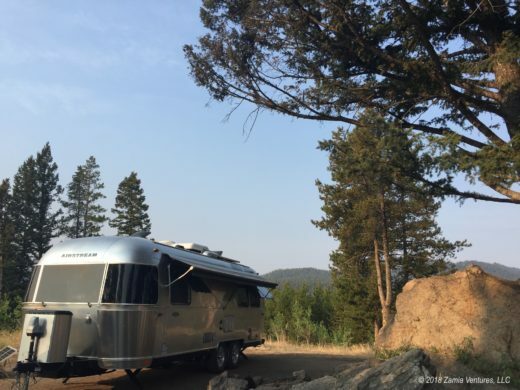 In an effort to escape from sweltering temperatures, we headed to a site near the Continental Divide at Homestake Pass, where we enjoyed nice views but a little too much ATV / motorbike traffic. Of course, I can’t complain about the price. Interesting place, especially the town reconstruction. We tend to really like those kinds of exhibits, but I agree with you: it’s disappointing not to be able to get up close to the objects. On the other hand, I totally get why they don’t allow it. The short version is: people are idiots and they can’t be trusted. 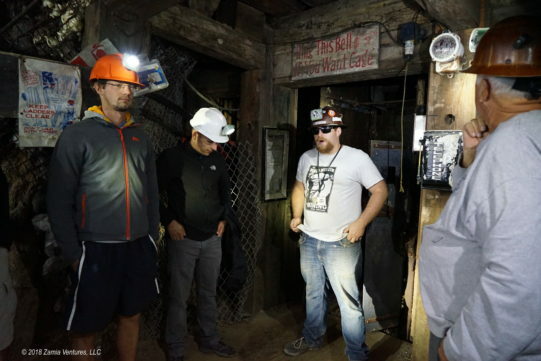 We did a similar mine tour in Bisbee, Arizona and also found it to be unexpectedly fascinating. And who doesn’t want to wear a hard hat?? Awesome! 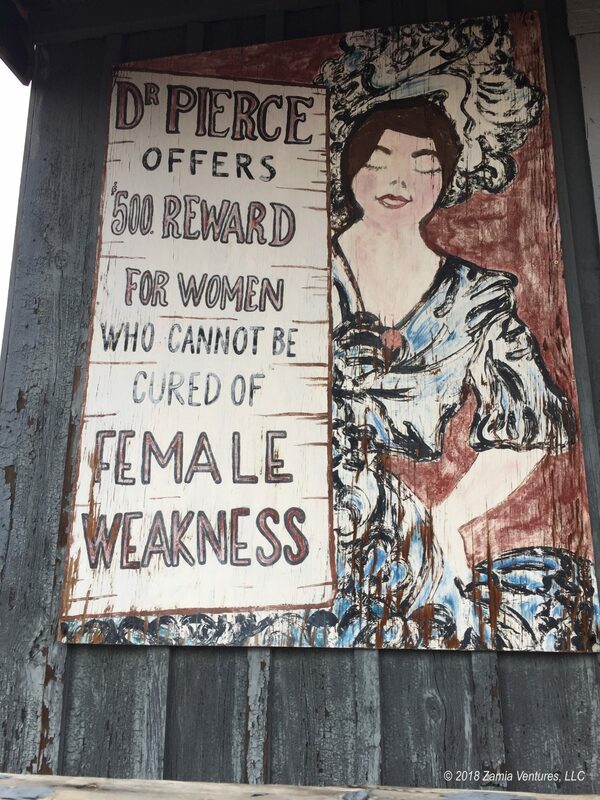 Also, if you like medical history, make sure you visit the pharmacy museum in New Orleans…. they have an incredible collection of instruments, medicines, and assorted ‘bad ideas’ that I think you’ll really enjoy seeing. Thanks for the recommendations — we will definitely check these out!